I raised my eyebrows when I first saw the line-up he’d selected, but the result redeemed him. The two surprise inclusions were Gervinho and Bacary Sagna at the expense of Carl Jenkinson and Lukas Podolski, but both players demonstrated their worth with impressive displays. …because we’re certainly quick to criticise him when he’s bad. The Ivorian was terrific in the wide attacking role usually occupied by Theo Walcott. Like Walcott, he was clearly encouraged by the manager to dart inside and support Olivier Giroud whenever possible. While the Englishman is undoubtedly a better finisher, Gervinho’s movement and dribbling ability is probably superior, and provided a constant headache for the Reading defence. We’re used to seeing Gervinho cause chaos on the pitch, but rarely for the right reasons. I don’t expect this performance to mark any kind of pivotal moment in Gervinho’s Arsenal career. I don’t think he’s about to embark on a long run characterised by reliability and consistency. The goals and assists will always be accompanied by glaring moments of miscontrol. The flaws in his technique mean he will always remain unpredictable and erratic. However, every so often it will click and work out for him. When it does, we should be grateful and gracious. Watching him, I began to worry that if we continue our gradual decline he will soon be too good for Arsenal as well. Since moving to England, he has been selected for the Spanish national team with increasing regularity. Among that group of players he represents something of an anomaly as he does not play for either Barcelona or Real Madrid. Not yet, anyway. I wouldn’t be surprised if Arsenal were eventually tested by a bid from one of the La Liga giants. Cazorla is a rare gem, and the twin powers of Spanish football know it. Regardless of what happens down the line, I’m determined to enjoy him while I can. If you love football, you love Santi. Until recently his season had been full of frustration. His potential is undoubted, but we’ve only seen flashes of his ability during this campaign. However, after an ebullient performance for England against San Marino, this cameo was full of the powerful running and energetic effervescence which built Chamberlain’s reputation as one of the brightest young talents in European football. …is a little misleading, due to our game in hand. Currently, Chelsea are just two points ahead, with Spurs a further three in-front. However, our North London rivals have played a game more. It’s incredibly close, and all we can do is continue to win our games and hope for more slip-ups from Tottenham and Chelsea. Both clubs are competing on more than one front, while Arsenal are have the advantage of a single and solitary focus. We know what we need to do. Yesterday was certainly a step in the right direction. I called it earlier this week and didn’t raise the alarm then. In fact, it seemed to me to be an entirely reasonable decision. As it was, Koscielny had an absolute stinker, and will probably find himself back on the sidelines for the next two games at least. I’m loathe to heap all of the blame on Kos, though – when you concede from a set-piece, more often than not it’s the result of collective disorganisation and a touch of cowardice. Positional intelligence is only worth so much: you have to fight to go and win the ball too. You know the saying: If you give enough monkeys enough typewriters, one of them will eventually thump the ball in to the top corner. Or something like that. I was pleased for Gervinho, but equally I’m conscious that he probably had about as much idea about where that ball would end up when he hit it as he did when firing off those haphazard shots against City. By the laws of probability, eventually he is bound get one right, as on Saturday. I’m not sure, however, that it makes him the solution to our striking problem. The defence “it was a tight angle” is not valid when the angle is only tight because of the strikers touch around the goalie. He had a perfectly good opportunity to strike before that, dallied, and paid the price. I make that three clear one-on-ones and a penalty he’s missed since joining the club. I’m not writing him off, but I am a little concerned. On which note, I won’t pretend to understand why Arsene saw fit to bring off our best finisher, Lukas Podolski, with twenty minutes to play. The first is that substitute Theo Walcott was very chummy indeed with his Chelsea counterparts whilst warming up. I suspect I’d find that easier to stomach if his time on the pitch hadn’t consisted of hiding in the centre when we needed him to be driving at his full-back out wide. I may be being unfair, but then if Theo refuses to commit to the club then I’m afraid he will invite this kind of scrutiny. The second thing was just how much of a hatchet job Mikel Arteta did in midfield. With Chelsea threatening on the counter, he produced a series of outrageous off-the-ball fouls to halt runners in their tracks. Fortunately, the referee missed most of them, otherwise he would have been lucky to stay on the pitch. The same goes for Laurent Koscienly, who appeared to slap a Chelsea player in the centre-circle. Arsenal lost a flying Dutchman this summer, but they also acquired a scintillating Spaniard. Santi Cazorla is such a good player that he shapes the entire team in his image. Yesterday, Arsenal produced a display of Iberian excellence, and Cazorla, as he has been since the moment he first pulled on an Arsenal shirt, was at the heart of everything. For some years now, Arsenal have been compared with those Kings of tiki-taka, Barcelona. Looking at Arsene Wenger’s team selection yesterday, the comparison felt particularly apt. Wenger is a known admirer of the Catalan style of play aped by the Spanish national team, and is gradually implementing elements in his own side. A few years back he adopted the iconic 4-3-3. Now he’s removed the burly, tough-tackling defensive midfielder, and replaced him with Mikel Arteta as a ‘pivote’ – a role based more on interceptions and ball-retention. Yesterday, he went a step further and introduced the nigh-mythical ‘false 9’. Surprisingly, Gervinho was chosen for the role. After a trial in the position in a pre-season friendly against Man City, the Ivorian was selected of Olivier Giroud, with Lukas Podolski and Alex Oxlade-Chamberlain continuing on the flanks. In midfield, Cazorla and Arteta were supported by Francis Coquelin, whilst the back four remained unchanged. Wojciech Szczesny made his expected return in goal, with Vito Mannone dropping to the bench. From the get-go it was clear Arsenal meant business. There was a speed and urgency about our passing that looked ominous, and the scoring was opened after just eleven minutes. Podolski turned away from three Southampton players in the centre of the field before playing in Kieran Gibbs. The defender’s shot appeared goalbound, but ended up going off Hooiveld for an own goal. Having been instrumental in the creation of the first, Podolski took centre-stage for the second goal, bending a beautiful twenty-five yard free-kick in to the top corner. The German was quick to point out after the game that scoring from set-pieces is not something he does regularly, although on that piece of evidence you have to wonder why. The goal was the highlight of another impressive performance from a player who looks entirely at home in the Premier League. Gervinho got in on the act next, collecting a clipped pass from Mikel Arteta and thundering his shot in at Kelvin Davies’ near post. It was an impressive finish – and one which made you think he should put his foot through the ball more often. A fourth goal felt inevitable by this point, and it came from a familiar source. Gervinho played in Gibbs again, and this time his cross was deflected home by Clyne. 4-0 before half-time, and Arsenal were on easy street. Perhaps too easy. In the dying moments of the first half, Wojciech Szczesny dropped a clanger (and a cross), allowing Fox to thump home a consolation and end our run of clean sheets. The Pole had one of his shakier games, and Vito Mannone was sent out to warm up twice during the ninety minutes. Whether or not there were doubts over Szczesny’s fitness, or whether the manager simply wished to remind him of the competition, we can’t be sure. In the second half Southampton improved considerably. The introduction of Gaston Ramirez and the persistence of Jason Puncheon gave them considerably more attacking threat, whilst Ricky Lambert made a more conscious effort to get one-on-one with Kieran Gibbs rather than the imperious Per Mertesacker for his aerial duels. In the end, however, Arsenal’s class told. Cazorla played in Ramsey did brilliantly to get beyond the defender and was unfortunate to hit the post. Fortunately, Gervinho was there to follow in and tap home. In that instance he was less a false nine and more a predatory poacher. In one game he’s reached half the number of goals he managed in 37 games last season. I was delighted for Gervinho. I am often quick to criticise him – and his decision-making does often test one’s patience. Yesterday, however, he played his role to perfection. This map of the player’s average positions confirms he did play centrally, but he showed a willingness to swap with Podolski and Chamberlain when necessary. His movement was tireless, and one-on-one with his defender there are few better dribblers. He had an excellent pre-season and is showing signs of improving on last season’s showing. If he can add consistent end product there’s no doubting his potential. In stoppage time came the final flourish. Cazorla again was at the centre of the move, slipping a pass in to the path of the cavalier charge of Thomas Vermaelen. When the Belgian’s effort was saved, sub Theo Walcott finished smartly with his left foot. Theo will have been eyeing Gervinho’s start in a central berth with considerable envy, but made the most of his substitute appearance with a few impressive runs as well as his goal. It wasn’t quite a perfect day – a goal for Giroud in his 15-minute cameo and a clean sheet were the missing ingredients – but it wasn’t far off. It’s been some time since we thumped a side quite so comprehensively. In the past we’ve been accused of taking our foot off the gas against smaller teams – not so yesterday. We looked as if we had a point to prove, and I’d suggest we made it emphatically. Perhaps a contributing factor in the hunger we’re showing is that this is side is so new: from yesterday’s starting XI, only Thomas Vermaelen was an Arsenal regular prior to 2011/12. That’s an extraordinary turnaround, and the result is a group of players eager to prove themselves to the those in and outside the club. Another consequence of that lack of an established side is genuine competition for places. One man guaranteed a start is Cazorla. 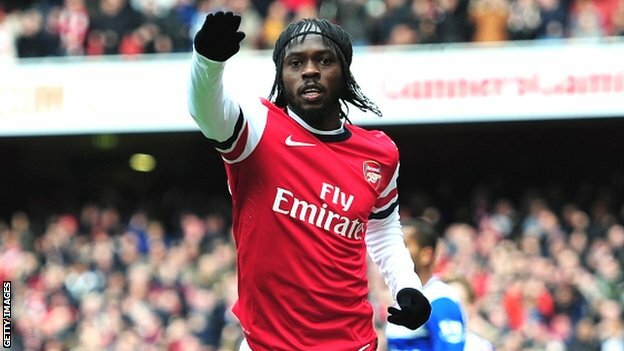 It was telling that with Arsene giving rests to the likes of Podolski and Gervinho, the little man remained on the field. He makes us tick. And yesterday, he made us tiki-taka. I suspect in your head, when you pictured the next man to raise a cup aloft and end our trophy drought, you never for a moment believed that man would be Johan Djourou. However, Arsenal are Markus Liebherr Memorial Cup Champions. Perhaps we should take that, and our Emirates Cup victories of 2007, 2009 and 2010 and use it to plug the gaping void after ‘FA Cup 2005′ in the roll-call of silverware that lines the interior of the Emirates Stadium. Obviously, in real terms, our victory in a friendly competition where we didn’t even play a full ninety minutes against a single opponent doesn’t mean all that much. But if winning is a habit, then this could one day prove to be a helpful step in the right direction for the many kids involved yesterday. Arsenal won the game thanks to a solitary goal, which showed off the qualities of both Carl Jenkinson and Henri Lansbury. Jenkinson showed good tenacity to drive to the byline, and then demonstrated why I’ve long insisted he’s the best crosser at the club with a devilish ball which Lansbury arrived to thump home. Whenever he’s played for the first team, Henri has shown a knack for arriving in the box at the crucial point, and this was no different. Personally, I hope he gets a long overdue chance in the first-team this season. His loan spell at West Ham was something of a disappoint, but a player with his style was never going to be the first name on the teamsheet in a Sam Allardyce side. We could do a lot worse than to keep him involved in 2012/13. Arsenal fell behind as Jay Rodriguez made himself an instant hero with the Saints fans by nodding home on his first appearance at St. Mary’s. It was a good cross but new assistant Steve Bould won’t be happy about how easily Rodriguez rose between our two centre-backs. With the games lasting only 45 minutes, there wasn’t much time to level, but Gervinho managed it with a corker. He sprinted to the byline and cut back inside before firing past the keeper. The confidence with which he took his goal was almost as surreal a sight as Djourou raising a trophy. Gervinho has duped us with these pre-season antics before, netting twice on his first appearance in a friendly last season, but hopefully this is an early sign that he may have a more successful second season than his first. A quick glance at the video reveals that our supposed left-back, Andre Santos, was in the six yard box. A poacher’s instinct from the tubby Brazilian. 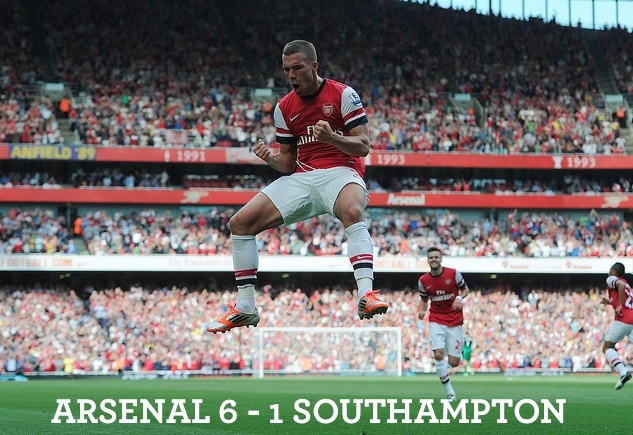 The game went to penalties, and Southampton emerged victorious, but it didn’t matter: the trophy was already ours. So, Arsenal are back. Next week the remainder of the squad will return to training before we fly to Malaysia in around a week’s time. Something tells me the coming days will tell us a lot about the make-up of our squad for next season.